A lead on social media is great, but conversion is better. Here are five keys to success in social media conversion. Social Media marketing is a powerful way to grow your business because it taps into a very basic marketing principle; word of mouth marketing. Just like you want people to tell their friends and family about your awesome products and services, you also want them to forward your messages on social media. This referral on social media can be to 100s or 1000s of people, depending on the message, the social media channel, and the proper strategy. But, you need to convert. Your social media marketing needs to provide positive results for your business. In marketing-speaking this means conversation. Embrace the following five keys for successful social media marketing conversion. Channel - Pick the proper channel for your product and your target market. What is your target demographic? Does the selected social media channel match? What are the characteristics of the channel? Perhaps your product or message is not a good fit. For example, does Twitter Marketing (Link) make sense for your marketing message? Can you position your value proposition in this lightening quick media that is limited by a 140 character message? If the answer is a resounding, 'no', then Twitter is not the proper channel for your message. Know the demographics of the popular social media channels and match them to your target demographic. This will help you deliver valuable content. Content - Social media is about being social. Connections - People want and need to connect. This is our highest priority in life. We, as human beings, as parents, as children, as buyers and sellers, all have the need to connect. We have an innate need to connect and this connection is critical to your business. Why should somebody connect to you and your business? Think how you can personalize your messages. Would you connect with you? Think about the businesses that you like and support. Why do you promote them on social media, or why do you follow them? Perhaps you love their service, or perhaps their clever marketing messages make you laugh. Social media is about connection, and that leads to conversation. Connections - People want and need to connect. Conversation - Don't talk; converse. Conversation - Don't talk; converse. Please stop the blah, blah, blah. If you talk at somebody you are bragging. If you talk with somebody, this is a conversation. Two-way communication is a requirement for conversation. All of the social media channels have tools for people to comment. A comment can initiate a conversation, and you need to acknowledge these commenting people. You can do this by commenting back, or asking thoughtful questions. Use your creativity, and as long as your market reacts positively to the conversation, then it is working. You are building a relationship via rapport and trust building. This leads to the final step in the conversation; call to action. Call to Action - Tell people what to do. Call to Action - Tell people what to do. To convert on social media, you need to know what that means. What is a conversion to you? Is it a call, or a purchase, or a download? There are many different business models and conversion could mean very different things to different businesses. Regardless of what the call to action is, there is one key commonality. You must make it very easy, obvious and straightforward. If you want people to call you, then tell them to call, and provide a phone number. 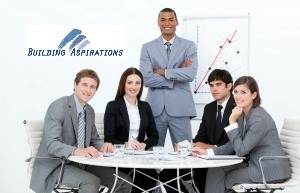 For example: Call Building Aspirations today for your online small business marketing needs (562) 883 2734. I get very frustrated when a client wants to set-up their social media profiles and just get started. Ironically, they feel annoyed with my questions about their target marketing and intended strategy. While, they would always plan a direct mail campaign, they somehow feel that they can just 'put something out' on social media and have instant success. You need to follow a plan. Perhaps you see the value with this method, but need help with implementation. Building Aspirations can help put this success plan into action for you. Connect with us today. We are experts with social media marketing. You know your business. Building Aspirations knows social media.